To make apples easier to handle, use a pencil as a stick handle. Cutting the apple from the top and out the bottom makes a ‘traditional’ apple print. Cutting through the middle makes apple ‘star’ prints. If you want to decorate fabric, for best results make sure to get fabric paints and the students should be dressed in old clothing or wearing smocks. Instead of students “dipping” the apple into paint, have students use a brush to paint color onto the apple & then print. If using tempera paint, add a little liquid dish soap to help with clean-up. 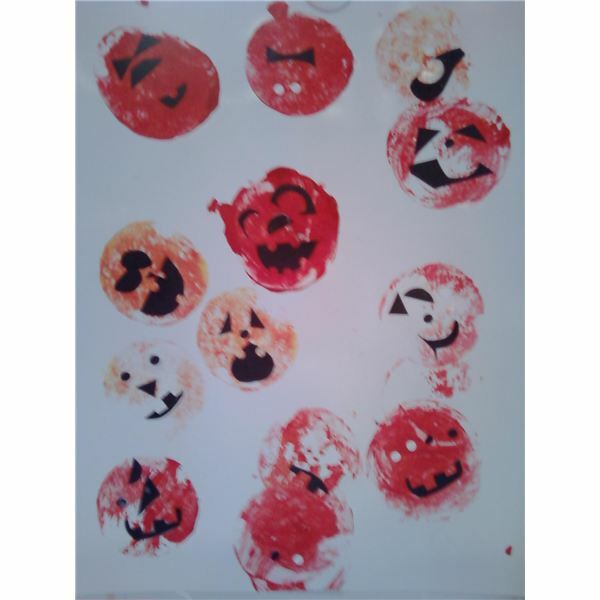 Print apples using orange paint on paper. Once the paint dries, use markers, paint, or black construction paper to make faces. Make stamps using apples. Cut an apple in half, carve out a face leaving the seed area as the ‘nose’ and using orange paint, stamp onto watercolor paper. Print apples on linen/fabric to make a table runner or Thanksgiving placemat. Have students alternate apple colors for a border, or print apples down the middle. Students weave two sheets of construction paper together to make a placemat. Print apples across the middle or create a turkey (see below) in the center. Use the apple to make a body with brown paint, use fingers to create the turkey feathers in colors, and use a cork (or thumb) for the turkey’s head. Students print apples and add a green stem with paint. When dry, students cut out and glue to the top of a popsicle stick. Turn plain old apple prints into pretty flowers simply by cutting four, tiny, wedges out of the cut apple half. (the star will be the middle of the flower) Use paint brush to paint two colors (one color for the middle & one color for "petals") and then print on paper. Encourage creativity and have students think of their own ideas for apple art prints in the fall theme.